A smart downpour on Friday forenoon has again inundated several parts of Guwahati. The busy G S Road has been submerged under knee-deep water in the shower that hardly lasted an hour resulting in a massive traffic snarl along the entire stretch much to the annoyance of the commuters. Even the R G Barua road was also submerged under knee-deep water leading to stagnation of vehicles. Several vehicles developed technical snag as water entered the engines of those vehicles. The Chandmari area has also been inundated by flash flood after the rain. The Jorabat and 13th Mile areas also witnessed waist-deep water on Friday. Several hundred vehicles remained stranded along the highway. The MLA hostel campus at Dispur in the heart of Guwahati was also inundated by flash flood with rainwater entering several residents of the old bunglows of legislators. 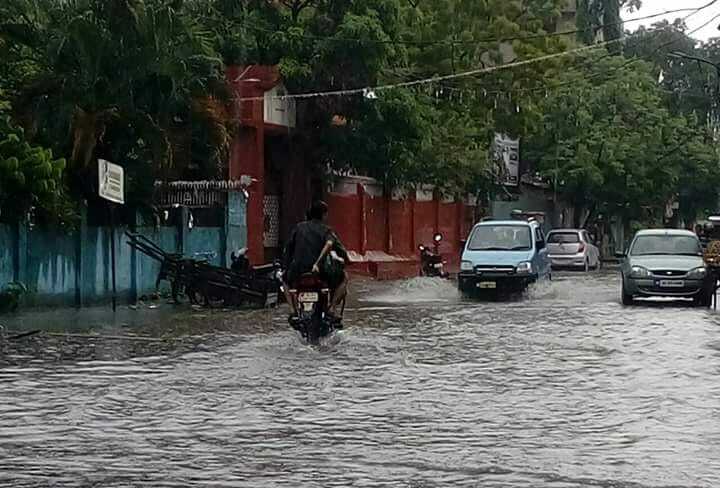 Several areas at Beltola, Sixth Mile, Panjabari, Hatigaon, Anil Nagar, Nabin Nagar and Ambari were also affected by the artificial flood created by an hour-long heavy shower.